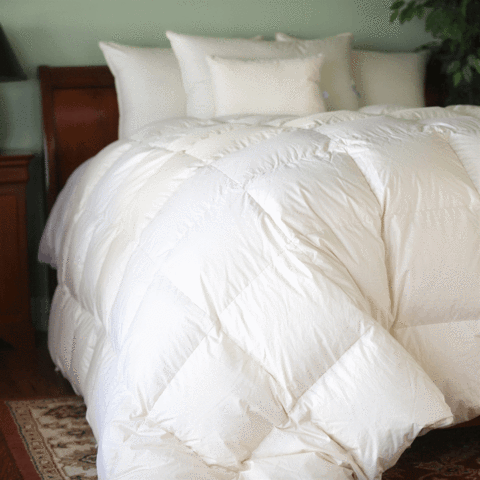 Sanitize and extend the life of your favorite feather pillows and down comforters. You wouldn’t consider washing your bed linens only once a year. How long has it been since you cleaned your pillows? Even though pillows are covered with cases, they still absorb body oils and stains. Over time, feathers disintegrate leaving pillows flat and full of dust and (probably) mites! Our unique technology is specifically designed for renovating pillows. It uses ozone emitting germicidal light to kill bacteria, sanitize, and deodorize the filling. Old ticking is discarded and your feathers are blown into new ticking making your pillow look, feel, and smell new again! The 100% cotton pillow ticking is 200 thread count with 10-12 stitches per inch to be certain feathers don’t leak through the seams. To see the process, watch the video (below). If you have unique pillow ticking (designer brands, gusseted or quilted top), we offer regular cleaning so you can keep it. Stains are addressed but may not be completely removed depending upon the fabrics used. Please note your preference on our Ordering Ram Leather Care! Do your pillows need a lift? 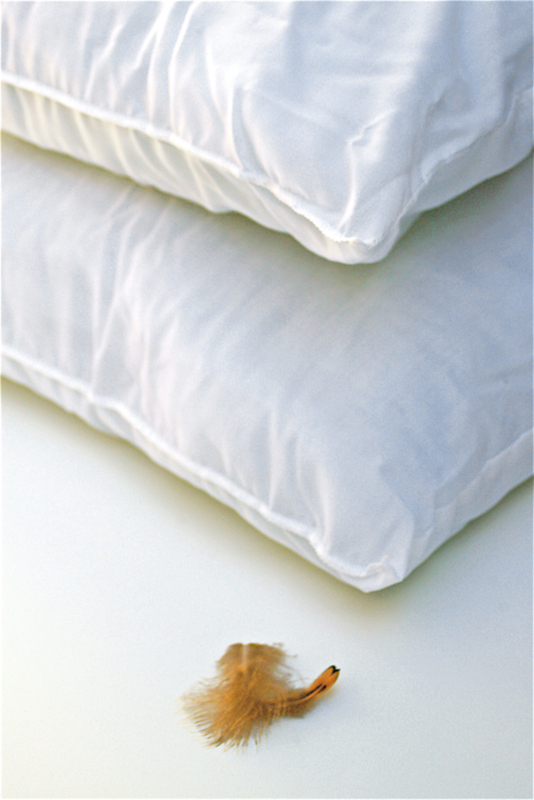 Adding bags of feathers (with quills) or down when remaking the pillow is a cost effective way to renew your pillow. Each ¼ lb. bag is about the size (not weight) of a cantaloupe. We can also combine two pillows into one using the feathers or down to make one great pillow out of two flat ones! We are happy to accommodate you at no charge. We have capabilities far beyond those in retail dry cleaners. If your local provider cannot provide the special cleaning services for your feather and down comforters require, send them to us. Our large capacity equipment handles virtually any size, every fabric combination, and every cleaning method down-filled goods might need. That includes camping gear! We clean sleeping bags with ease while some dry cleaners reject them. For fur and imitation fur blankets, see our Fur Accessories page. How often should feather pillows be cleaned? We recommend cleaning your pillows annually, more often if expense is no object. We’re happy to answer your questions and tell you about our feather bedding cleaning services.